I did another really quick video yesterday since we are supposed to have an impending server reset. In the holiday weekend since the last restart folks have filled the server with all sorts of nifty stuff. So I thought I would do a really quick video showcasing some of the cooler things. The highlight for me is the alligator. I am wondering who built it, because seriously it was perfect. The server has essentially exploded with pixel art everywhere, some of it seeming to be freehand which is pretty amazing. While this is all interesting I am hoping soon we get a bit more substance. It was rumored that we would be seeing a new patch today or tomorrow and in it I am really hoping they introduce two things. Firstly I want to see the crafting system and all the nifty things it can produce. This is likely going to be a massive thing because this also means they will likely change they way the blocks work so that we actually harvest them instead of just destroying them. Currently the game works a lot like Minecraft creative mode, where you have pretty much unlimited resources to place at your disposal. While this is cool for free range building, the game however right now is lacking a “game”. Wandering around and exploring, engaging in combat is fun but I feel like we need something to give us a sense of purpose. The second thing I want badly is the cornerstone concept, aka your plot of lands that persists to each server you play on, and that no one else can disrupt. Part of why I have not built much of anything yet is the fact that we still have way too many mad bombers on the server all to willing to destroy your hard work. In fact I railed on Shawn Shuster of Massively a bit in the video as in his walkthrough that was posted yesterday… he was all too happy to blow up other peoples creations. There have already been some pretty epic works of art destroyed by some idiot who would not suppress their inner poo flinging monkey long enough to appreciate what had been created. While I realize this is a side effect of having a game with no rules yet, it still depresses me to see the world as Swiss cheese. I am sure once the new patch has gone life I will do another quick video showing off what it added. So stay tuned to my channel and I will post something up there as soon as it is available. 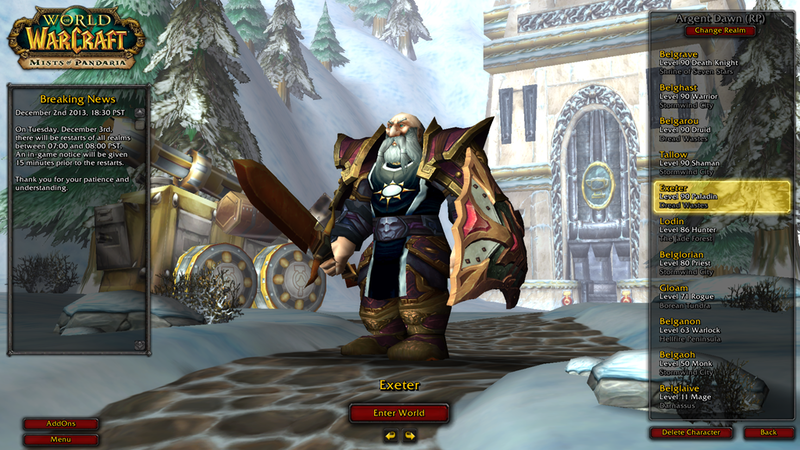 Also last night I managed to push my paladin Exeter to 90 and with it came an achievement that I was not expecting. Apparently Quintessential Quintet is a thing? I cut an odd path on this one, by the time I left Jade Forest I was already 87 thanks to all the mining nodes. From there I made a beeline for Kun Lai, and critpathed my way through the zone until I reached the quest chain that lead to Townlong. Similarly in Townlong I quested my way through the Shadopan chain until I reached the jumping point for Dread Wastes. All of which was to set myself up perfectly to be able to start working on Klaxxi quests as quickly as possible. Why you might ask? This is my blacksmith, and all the nifty things you can create seem to be on the Klaxxi vendor. Namely I wanted to be able to start creating masterwork weapons for all my other characters as I get them to 90. That seems to be the big weakness as it comes to the Timeless Isle content. You can gear your alts up with 496 extremely rapidly, but you have a few glaring holes… namely your weapons. Also I seem to have a much harder time getting Curios for trinkets, and the neck/ring slots to drop on the Timeless Isle. So as a result I have ended up spending a fair amount of time trying to remediate their gear just so I can be able to queue for something. Timeless Isle is nifty, but I really miss the equivalent of the Icecrown 5 mans. I wish there were heroics that I could run that actually provided something viable for filling out a set of gear. I feel as though they should really have put in a new 5 man that dropped 496 weapons to go with all the gear they are handing out like candy. Even with epics… a crappy weapon is still a crappy weapon. Right now my paladin for example is using the treasures of pandaria BOA one handed sword that you find on the ground. Which is better than anything he has gotten yet, but at least being able to create the masterwork hammer will be something slightly better. I think those are 463 ilvl which is essentially what the heroic gear is. I have to say getting Exeter to 90 was a pretty cool thing. He technically was the very first character I created, and my intended main. For years my internet handle was “Exeter” and quite honestly “Belghast” was my main over in DAoC, and it was not until late in Vanilla that I started to play that character as a main. All the while through vanilla my main was Lodin the hunter, and it was an almost accidental occurrence. I had a death in the family that pulled me away from Warcraft a few weeks after the release of the game. As a result I got rapidly outpaced by the rest of the guild, and back then soloing a Paladin was a truly painful experience. Hunters were the gods of soloing, so I started leveling Lodin just to be able to keep up with my friends. Within a very short amount of time I had caught up, and when we hit 60… I got drafted into the raid group of a guild member as they wanted to replace a troublesome hunter. I had no intent to actually play a hunter as my main, and in truth I am not terribly suited for the class… but I did for almost all of Vanilla because it was my “Raid main”. Once you start playing a character in a raid group you are pretty much committed to always play that character until they no longer need it. The positive effect however is that I met so many life long friends through raiding, and that the Late Night Raiders hunters were all such amazing people. As soon as Burning Crusade was released, I saw this as my opportunity to leapfrog Lodin in gear and start playing Belghast as my main. That is the awesome thing about expansions, the gear reset lets you change your focus. 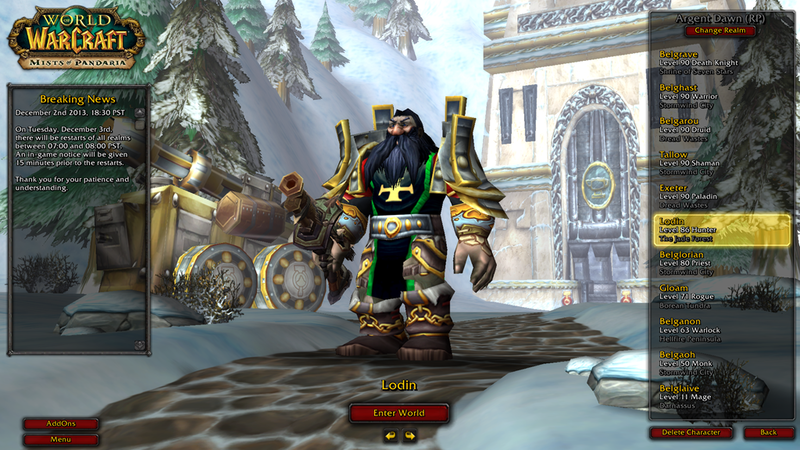 From that point until the tail end of Wrath of the Lich King, I was a warrior main tank. It was not until I needed a break from the hot seat that I switched focus to the Deathknight and fell in love with it. All of this time I felt horrible for leaving Lodin abandoned in the dustbin. It was not until Cataclysm that I actually managed to level him out of the outlands. During one of my last sessions playing I pushed him up to Pandaria levels, so I feel as though it is probably his time to shine again. I pretty much permanently run around in Giantstalker transmog in honor of the fun times I had with him raiding during those early days of Vanilla WoW.